Home EDUCATION HEALTH MKU kicks off a 4-day Free Medical Camp for public at their main campus. 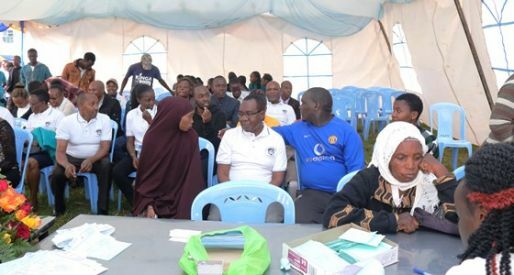 MKU kicks off a 4-day Free Medical Camp for public at their main campus. A section of the participants at the MKU Free Medical Camp at their main campus in Thika. Mount Kenya University on Monday kicked off a Free Medical Camp at its main campus in Thika. The camp that was officially flagged off by its Vice Chancellor Prof. Stanley Waudo will run until Thursday 2nd August 2018 and will offer free medical services to members of the public. It was preceded by a ‘Free cancer screening sensitization walk’ where participants walked around Thika town. It has been organised by a team specialist doctors from the MKU College of Health Sciences in conjunction with their colleagues from Nanavati Hospital, India, Kiambu County and Zambezi Hospital. There will be free lifestyle diseases awareness and cancer screening services at the medical camp whose theme is “My Health is My Wealth: Take the step, reduce the risks”. The Medical Camp is an important engagement with members of the community and it is the Universities Corporate Social Responsibility. Nutrition assessment and Health education on lifestyle diseases. “We hopes that members of the public will get access to quality cancer and lifestyle diseases screening at no cost. In addition to the screening, visitors to the medical camp will also receive advice on nutrition in addition to enjoying dental services at no cost. We hope to extend similar support to other regions of the Country in future,” Dr. Kirira, Director of the MKU Foundation.